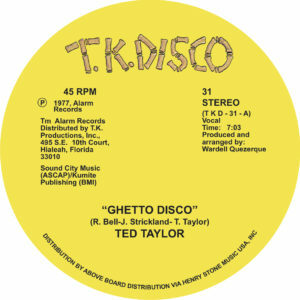 Legit Reissue of Ted Taylor's long sought after "Ghetto Disco" 12" excavated from the deepest realms of the TK Disco vaults! Funky, rough round the edges in the best way, tough ghetto Disco grooves here from 1977, delivered by the mighty Ted Taylor who was originally a blues singer from Oklahoma. Pairing Taylor's soul-steeped voice with the sunshine-state production values of the legendary Wardell Quezergue ('Mr big stuff', 'Groove me' & more! ), this one's a dance-floor sure-shot. Never has a track been more aptly named. This is a proper underground jam, one that, until now, was the preserve of the heads, diggers and Disco freaks. The eagle eared out there among you might recognise it from a certain underground hip-hop cut, answers on a postcard please! Pure Disco heat from Miami, yet again. A bonafideTK Disco classic! Remastered, represented and brought back into focus for 2018's DJ bags and dance-floors! As usual, these TK represses are always done in the proper manner. 100% legit from the archive, remastered and released in conjunction with Henry Stone Music / TK Disco - Miami FL.